The team at ibis Bursa Hotel will be glad to welcome you warmly with traditional Turkish hospitality. 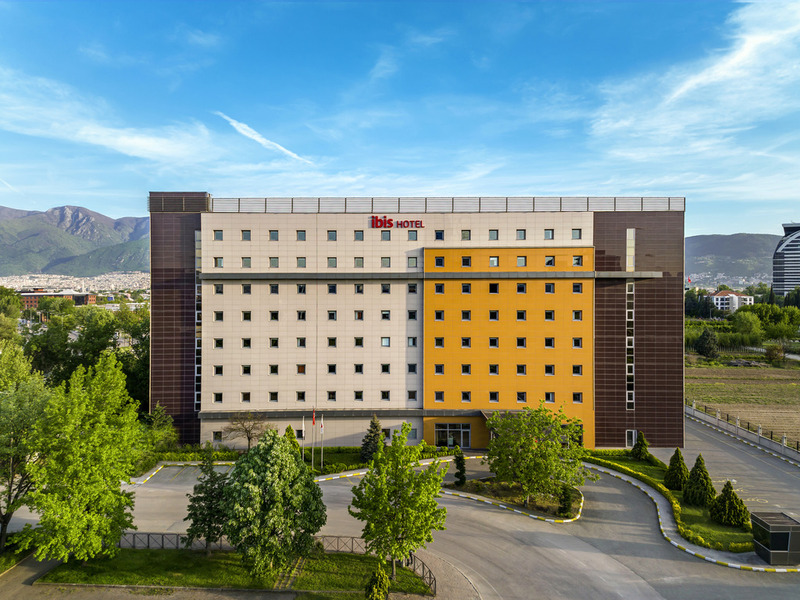 Ibis Bursa is a 3 star hotel located in Bursa. Hotel is located in the Buttim Business Center. Tuyap Bursa Fair Ground and major attractions and commercial areas of the city is just a few minutes from the hotel. 200 rooms, free internet access, soft drinks and snacks available 24/7. First of all, I would like to thank Bursa Ibis Hotel staff. I was a stranger in this city, but especially the reception and kitchen staff was very helpful. Performance-based prices could be more appropriate. In addition, there should be equipment in the bathroom, such as ear wax and hair conditioner. Other than that, the experience I had during my stay was quite good. Thanks you for all. Friendly and helpful staff, clean, it was a nice and problem-free stay. It is totally not bad but I stayed in your hotel also before. I got tired with your issue of that the key does not work even in elevator. At all time I stay in your hotel I turn back to reception desk and activate key one more time. Also you placed a kit in front of elevator to control whether the key operating, but also this kit were not working. the receptionist is one of the stupidest worker or reception have ever met in my life.i booked the hotel online, came to the hotel with bags he didn't even welcome or neither does he care well thats fine.. he asked for my id i gave him he asked for the money i gave him , then he said he told me you booked a single or double i guess you could see what i booked from my reservation i said to myself but well i answered i said double, then he told me where is the second person i said she will come but not here yet he told me he needs the second person id to complete the booking i said she will give that when she arrive , he told me no he needs it now i said i dont have it i told me give me the name then, i gave him, then he told me to sit and wait until that person comes i laughed and told him but i have paid for the room and all , then i said what if the person never show up... he then was confused and said you can go to the room.. hahahaha, he said the elevator is at the back of the tv , i said please can you just lead me to the room or atleast the elevator its my first time here...in the room it was too hot we called to ask how to regulate the air conditioner , the reply was just turn it off ....hahaha i think this place is a motel not a hotel. Hotel room and breakfast lounge was old and dirty. Hotel must be restore.Because room was old.Restaurant was not clean.But I like İbis everytime.İbis is my second home.I will prefer İbis at my holidays and travels.Because I don't like bad surprise.And It is cheap everytime. Dirty aisles, poor breakfast, loudy late night guests on the aisles. It was a dissappointment for me. I have been stayed on IBIS Bursa 4-5 times. This was the worst. Aisles was very dirty. There were napkins on the floor. Iron room was very dirty also. There were no water on the room. The late night guests (kids) was running loudy on the aisles. Breakfast was totally bad. The tee, and the cucumber and domatoes were not refreshed after guests consumed all of them. Thanks. Room was small but has a very comfortable bed. Receptionists are very kind and helpful. But since the hotel is near to exhibition area, I think there must be dry cleaning service longer and reachable. When you are a businessman or woman, going and making your own ironing in the area without air conditioning is ridiculous. The hotel is much less than I expected. The expierience? Awful. The restaurant wasn't open (so we had nothing to eat, except a chemichal pizza), the breakfast was less diversified than two years ago! I stayed at your hotel two years ago and then the experience was a lot better. Now your services are very low. Pleasure to stay in Ibis Hotel in Bursa. Comfortable bed, slience enough, temperature was good. I had very bad experience at IBiS Bursa The reception staff are not good, also most of them doesn't speak English which make it difficult to understand each other. It is great for the price. Whenever I go anywhere my first choice is usually the Ibis Hotel located there. It's always the same so I don't get any bad surprises. Great places to stay for really cheap. Ibis Bursa was no different. I made my reservation via phone. Reception was kind and helpful on the phone. The receptionists informed me well about the facilities very well and made me feel &quot;comfy&quot; as they welcome me at the desk. The room was clean and neat. Air conditioning was a bit noisy. The breakfast was matching its price but lacking a bit of variety ( no scrambled eggs is a deal breaker). Again the kindness of the staff covered that bump. It was very nice overall. Probably best Ibis Hotel in Europe. Very conveniently situated near Bursa Fairgrounds, nice and green environment , clean and cleverly furbished rooms, excellent breakfast, nice restaurant . Strongly recommended as a hub to visit Turkey's northwest.